In this recipe called “Zucchini Variations”, I used about 3 zucchinis per serving of about 130 gr and 15 cm each. If you are thinking that 450 grams of zucchinis for a main course is too much, what about those 500 gr of red meat we eat when we decide to go for a serious steak? Don’t get me wrong, I love meat, but zucchinis can also be a satisfying alternative as a main course. The following 3 recipes – plated into one dish – were made using three zucchinis, so the serving size is 1. This can also be a bountiful, delicious appetizer. You choose!!! Dice zucchini and add salt. In a skillet heat extra virgin olive oil over medium-high heat and lightly brown zucchini. Let it cool. Using a hand mixer, blend cooked zucchini with buttermilk, Pecorino cheese, olive oil, some basil leaves. Blend it until you get a creamy consistency. Add salt and pepper to taste. Meanwhile marinate red onions in lemon juice for 30 minutes. Add salt and pepper to taste. To prepare concassé tomatoes, cut an X in the bottom of the tomato and place it in boiling water for 30 seconds. Place tomato into water and ice bowl to stop the heating process. Peel tomato and dice it finely. Add some olive oil and salt and pepper to taste. Here is a link on how to prepare concassé tomatoes with step by step pictures. Using a small jar or glass, pour zucchini cream, place marinated red onion slices on top and finish it with the diced concassé tomatoes. Drizzle with olive oil and place a large basil leave for garnish. Cut off the ends of the zucchini. Slice very thinly lengthwise. If you have mandolin, use it to cut the slices. Discard (or use it for another recipe) the first and last slice since is the skin. I usually get about 4- 5 slices per zucchini. Add salt to zucchini strips and let it stand for 30 minutes. This will soften the zucchini strips for an easier rolling. Using a mortar and pestle mix together the ricotta, pine nuts, cinnamon, and chives. After the zucchini have softened place about 1 tablespoon of the cheese mixture at one end of the strip and roll up. Wrap each roll with a chive an tie. In a skillet heat extra virgin olive oil over medium-low heat and add zucchini flowers cut into petals. Add salt to taste. Arrange flower petals onto a dish simulating a flower, and place the rolls filling side up, drizzle with olive oil and sprinkle with some fresh ground black pepper. Zucchini alla Scapece with red pepper chunky sauce. This is a traditional Southern Italian dish that consists of marinating vegetables in vinegar and/0r herbs and spices. Since Southern Italy was under Spanish rule around the 700s, making vegetables alla scapece (or in Spanish escabeche), is a cooking method Italians inherited under the Spaniards’ ruling. Slice the zucchini, salt them, and fry them in olive oil. Drain the slices using paper towels. Combine vinegar and water, and garlic and place them in a small pot until and bring to a boil. Add one tablespoon of frying oil to this mixture. Pour the liquids into the zucchini and cover it with plastic wrap. Chill for 24 hours in the refrigerator, and serve. To prepare roasted red peppers chunky sauce. Preheat oven to 200° C (400 °F) for 15 minutes. Place red peppers and broil for about 30 minutes or until skins are blackened. Transfer peppers to plastic wrap or bag. Close the bag or seal with plastic wrap, and let peppers steam and cool. Unwrap peppers. Pull off and discard skins. This step can be done under running water. Cut peppers into strips and the dice them. Add mint, sugar and extra virgin olive oil and combine. Using an expresso coffee cup or another small cup, cover the inside with plastic wrap and place zucchinis that previoulsy have been drained form all liquids. Press the mixture with a spoon to firm it up and place the zucchini cup upside down into a plate and gently pull the cup and plastic wrap up. Using a serving spoon (I used a ceramic one), place red pepper sauce besides the zucchini. A beautiful and imaginative trio! This is such a beautiful main course, Ambrosiana. I would be stunned to sit at a friend’s table and have this plate set before me. 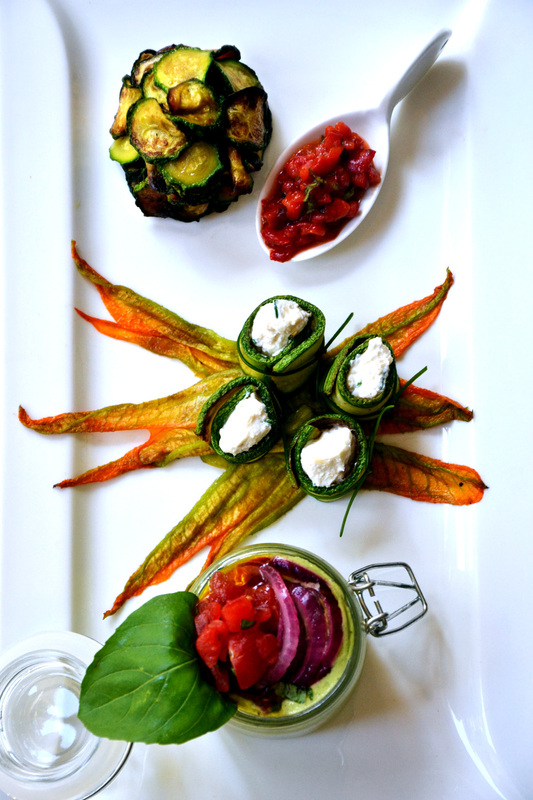 The zucchini rolls set atop the blossoms are really quite special, a feast for both eyes and palate. What a nice complimet John..Thanks!! Indeed, using the blossoms add that special touch! Nice to read your stuff again, Giselle. 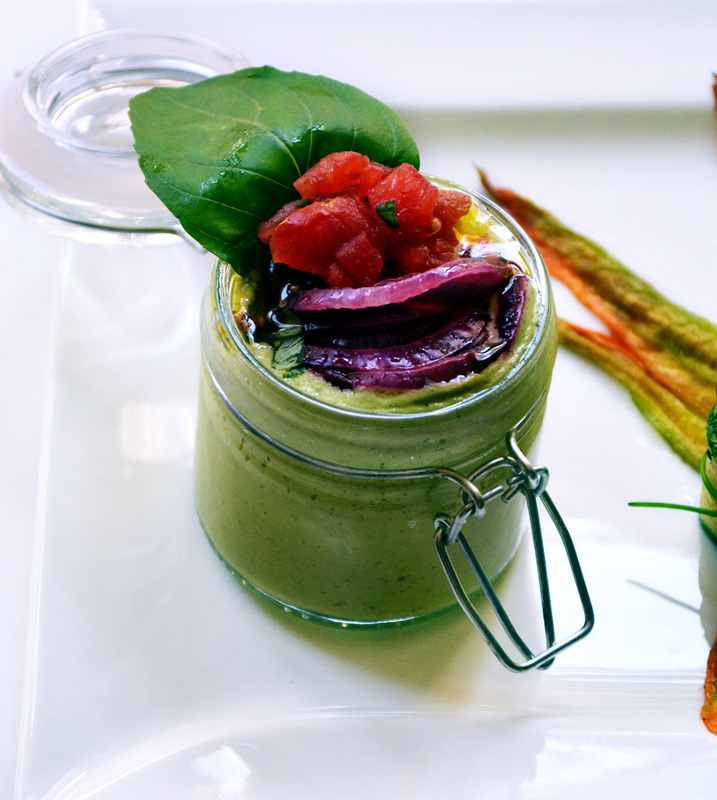 Interesting to hear about the “escabeche” link, You’ve made a wonderful savoury course based on a cafe gourmand. Such a cool idea. Enjoy your holiday. Thank you Roger! I am happy you liked it!! These are works of art – wonderful photos and delicious flavours! We eat vegetables, especially peppers, escabeche here too. I didn’t know the Italian version – thanks for a new word, for me! Thank you!! It is interesting to find out that this escabeche method is aldo used in France!! Yes, I always thought it was a Catalan dish which was why we had it here! Thank you Celi!! I suggest you to try the cream out. Buttermilk makes it even richer!! Thank you Karista!! I am glad you stopped by!! I’ll check your blog out too! What a work of art! A lovely presentation and WOW factor! Each one sounds so delicious and perfectly balanced. I’m looking forward to trying each one of these out! Superb food styling. Well done. Thank you for your nice compliment!! I think summer colors help in food styling too! Beautiful photos. When summer draws to a close I am always on the hunt for inventive and beautiful ways to use the plethora of zucchini from our garden. Your recipes will definitely go on the list. Thank you! I am gald my blog was helpful in ideas of how to use your zucchini!! 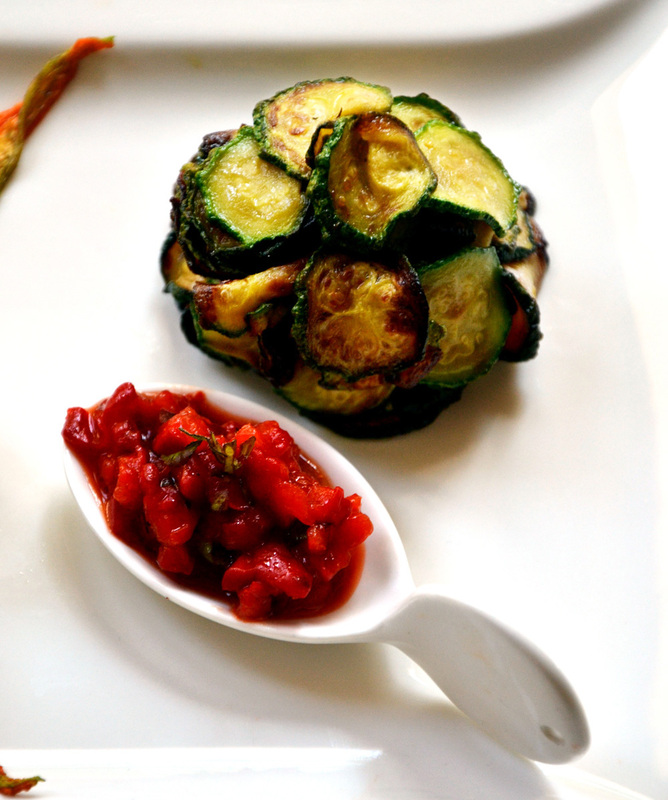 A very interesting variation to zuchinni….ideas I have never tried myself before. Thank you for sharing! You’re welcome!! I am glad you liked them!! My mouth is watering! I’ve been using the same zucchini recipe lately and with the abundance of zucchinis around here, seeing your recipes makes me excited to cook something new! Beautiful presentation! Thank you! 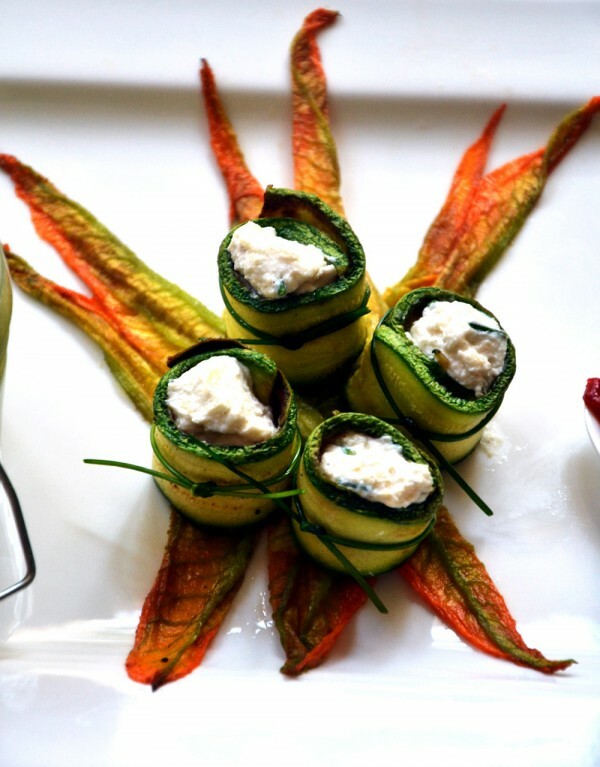 I find vegetablas – in this case zucchini – the most versatile ingredient there is!!! Wow! That is such a good idea and healthier option to pasta, specially if you are cutting down on carbs! Beautiful post! You’ve made the common zucchini into a beautiful work of art. I love zucchini but have never had it any of these ways. I am really interested to try the zucchini cream..Looks delicious! Thanks for the recipes! You are welcome!! Thank you for your nice comment!! 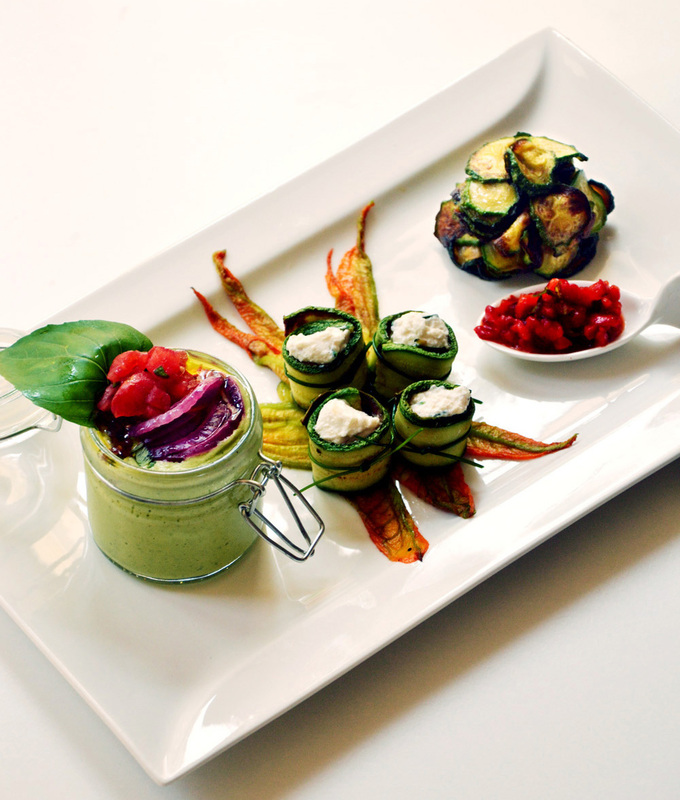 Indeed, with the simplicity of zucchini, one cna come up with endless ideas for cooking! Thank you very much!! I am glad you liked it! Loved it. I’ll definately be cooking more zucchini now…mmm. Wonderful! Thank you!!! Well it’s zucchini time!!! YUMMY! i love zucchini and always run out of ways to use it! my mom made me zucchini spaghetti last week but this is above and beyond! love it!! Oh!!! I love zucchini with spaghetti (typical dish of Southern Italy) and I usually make it at home!! My husband loves it!!! Thank you cery much and thanks for stopping by!! The food are really special. I am learning too. Thank you!!! You are very kind! Just added zucchini to my grocery list, thanks! Thank you!!! Don’t forget the blossoms :)! Looks Great! A little Hot Sauce and it would be perfect! Good idea!!! I’ll give it a try!!! Thanks! Great blog. Wonderful plating. Very creative. Definitely want to try these out! Thanks for rebbloging!! I am honored! What a beautiful display. Loved it. Wondering what you can do with zucchini? This amazing blogpost offers lots of idea! Thank you for rebbloging it!! !..I’ll check your blog out!! the recipes look amazing, can’t wait to try them! Thank you!! You said it!! The simpler the ingredient, the more creative one gets!!! I love the recipes and the photographs are stunning! Congratulations on making it to freshly pressed, well deserved. Thank you Kate!!! That is very kind of you! It is so amazing and I never ever thought I’d make it to Freshly Pressed! Thanks for stopping by! oooh!! nom nom nom… looks yummy! zucchini recipe is one of the taste I enjoyed very well. Thanks for sharing this recipe. You are right – it sounds filling without being too heavy. I think I’ll even give ricotta a try again. I don’t care for it in cannoli or lasagna, but those zucchini rolls look like they are worth the risk! Even though Ricotta cheese is a light cheese, in lasagna or cannoli cn be overwelming. Adding it to zucchini is a lighter as tastier alternative!! I was the only person at our house that didn’t like cannoli and they thought I was weird, but I didn’t like the candied fruit in it either. But I will try it with the zucchini. Who knows? I’m older now and that picture sure made it all look so good! Cannoli is a very sweet dessert, and that sometimes can be overwhelming, so thre nothing wrong to not like them! Personally I don,t like candied fruit either! If you ever try this recipe with zucchini, let me know! That sounds interesting! Thank you for your beautiful compliments!! I really appreciate them! Zucchini is growing rampant in New England US this year and well every year and it’s probably one of the harvests that people given away because they run out of ways to use it. These are gorgeous, and I will repost the blog on my blog though I fear it means no one will give me their zucchini any more…oh the things I do for my blog! Thanks for this great article! I am glad you came up with this comment!! It may sound weird but some great produce gets thrown down the drain because people do not know how to make the most of it. I find zucchini one of the most versatile ingredients for cooking. I learned this in Italy, where people eat a lot of vegetables since it is part of their wise Mediterranean diet! Thanks for rebbloging!!! Thanks for rebbloging my post! It looks all really yummy and well presented! Thank you! I am glad you appreciated the plating! Lovely ideas! And beautiful too! Thank you! I hope these are inspiring for you! Hi! Fried zucchini blossoms stuffed with anchovies and mozzarella cheese are very common in Roman pizzerias. I love them but I have never tried them! Maybe my next recipe? Wow! You are really zucchini-minded! Your recipes sound great and I am very happy you really enjoyed my post! Wonderful recipes! We love zucchine and grow them so we have plenty of both the zucchini and the flowers!! You are so lucky you grow our own! I am glad you liked my recipes! Thanks! Love Zuchinni, and your dished look gorgeous and tasty. Wil try them for sure! Thank you! I am glad you will try them! Hi! If you cannot eat dairy products, you can use soy products such as tofu. You can also replace cheese with white beans such as Cannellini beans! Wow! Thanks. Will definitely have to try that. All of your food looks so great and I want to try these recipes on my family. You are welcome! Contact me if you have doubts or need clarifications regarding my recipes. Too beautiful to eat. I have such wonderful memories of the fiori di zucca when we traveled to Rome in the summer! That was exact the same comment my husband made when he was about to it them! Fiori di zucca are very typical of Roman cuisine and I love them too! I love your photography, your food presentation is fantastic, and the recipes sound great too. What a winning post. Thank you for all the beautiful compliments! You a very kind! All three recipes look delicious! The photographs are beautiful as well. Thank you very much! And thanks for stoping by! Absolutely lovely to look at and I’m sure that all three taste delicious. It would be hard to decide which to taste first. I’m having problems with your posts showing up on the reader. I’m going to refollow to see if that helps. Thank you Karen! I am g,ad you liked them! I am sorry to hear that your are having problems seeing my posts! I hope you work this tech thing out! I will have to pass these recipes over to my wife. She loves trying different stuff in the kitchen. Like you sometimes we prepare vegetables as a side dish or as a main course. While meat is all good, there are times when you need to give it a break. Thank you! I agree with you! I love meat but sometimes you need to try out different things out! Ipgoing vegetarian sometimes does not harm at all! Good! Let me know how it goes! Wow delicious! Zucchini is such a refreshing vegetable and you made so many lovely variations on it. Thank you! This is the time to profit from zucchini since it is a delicious seasonal product! YUM! And I picked up zucchini from the farmers market this weekend! Just need to pick up some riccotta and I am set! Hi there! I am glad you are trying my recipe out! Thanks for stoping by! New ways to use zucchini!! Gorgeous plate of food. I love the colour of your zucchini flowers. My flowers always grew much paler. Every now and then I too like to make artwork out of my food with wild colours and composition. We eat with our eyes. Oh and congrats on being Freshly Pressed! Hi there! Thank you for your kind comments! I think that food enters through our eyes so if you plate it and make it colorful, you will amuse whoever eats your food. It is also important to use simple high quality fresh ingredients – the key to a great dish. Also, Great food does not have to be expensive: with some seasonal veggies, fresh cheese (you may want to use fresh local cheese I stead of ricotta), and some herbs, you can create an array of wonderful dishes – at a low cost! I am pleased to tell you that you have been nominated by little old me for the Lovely Blog Award. You can pick up your Award and see the rules for the Award at http://joyoftraveling.wordpress.com/2012/08/14/touched-honoured-one-lovely-blog-award/ . Congratulations!! Thank you! I am truly honored! I am definitely going to mention it on my next post! I’m so impressed with the photos and would love to taste the zucchini! Lovely food. Thank you for your nice compliments!i am glad you liked my recipes! Great dish! It looks so appetising that I feel like zucchini right now. vraiment très belle réalisation et variation sur la courgette ! Thank you, thank you, thank you Sawsan! Coming from you it is a great compliment! Beautiful, pictures and recipes! I love the idea of the zucchini cream. You have a beautiful blog too! Thank you very much! And thanks for stopping by! Are you kidding me!? This is absolutely out of this world! It’s not all that often that prepared food can take my breath away, but Ambrosiana, you’ve just done that very thing! Really exquisite…recipe, plating, photography. Wow spree! You are so kind and very sweet! Thank you for this lovely comment! Reblogged this on Hi From Down Under.